Colour (in the US, Color) was my first book, published in 2002. The first journey, to Chile, was made in 1999 when I was helping friends with a documentary on Pablo Neruda and I just happened to bump, in the metro, into the man whose father had helped bring cochineal to Chile from Peru. This isn’t what started the book (that happened when I was eight, in a cathedral in France), but it is the coincidence that kicked me to actually write it rather than talk about it. It involved 17 journeys to places like Afghanistan, Iran and Mexico, as well as thousands of hours in libraries around the world. My favourite one in memory is the Calcutta library with the fans lazily drifting above, and the smell of old paper and warm grass. My favourite one in reality is the British Library. My husband says he is glad they close it at night, otherwise I would live there. 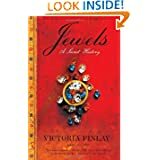 Jewels was my second book. I went to 14 countries, including: Cleopatra’s (almost) lost emerald mines in the middle of Egypt’s desert; Burma’s ruby mines; the biggest amber mining town in Russia, which once was a gulag; the Australian outback for opals… even as I type this I’m caught up in nostalgia for those journeys, and the people I met. 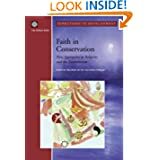 The third book – and if somebody had a bet with me 10 years ago that this would be the title of my third book, I’d have lost some money – was Faith in Conservation. I wrote it with my husband, Martin Palmer, and it was published by the World Bank in 2003. They said it was one of their best sellers. The first five chapters are mostly his stories, and some of my own (e.g. the bedbugs were mine), about starting this work with HRH Prince Philip, and how religions can really have a huge impact on environment work. You can buy the original from amazon, or you can download the pdf free of charge. My fourth book came out in November 2014 titled A Brilliant History of Color in Art and published by the Getty Museum in LA. It has plenty of fantastic illustrations, many from the Getty itself. 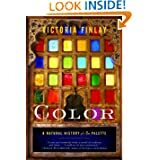 Just finished reading Colour — Thank you soooooo much Victoria. I had such a wonderful time thru the paintbox. Now to find a copy of Jewels. I was given Colour years ago, and still venture into chasms for some textured wonder. Have just bought a copy for my sister in law. What a fabulous book Colour is. I am envious of the travelling you undertook to complete the book and cannot wait to read your other boks. Thats got to Be Lightning Ridge as your heading photo – haha- just looking for your book “color” and came upon one of my home places! enjoyed color! Look forward to your upcoming color in art book – keep me posted! I am reading Color for the 2nd time. As an artist, I feel like I’m walking through a painting in my mind. I savor each page, and make myself read slowly…I don’t want it to end. This would make a fantastic documentary! Please!! !